* Annual estimated passenger usage based on sales of tickets in stated financial year(s) which end or originate at Manchester Airport from Office of Rail and Road statistics. Methodology may vary year on year. Manchester Airport station is a railway and tram station at Manchester Airport, England which opened at the same time as the second air terminal in 1993. The station is 9 3⁄4 miles (15.7 km) south of Manchester Piccadilly, situated at the end of a short branch from the Styal Line which is accessed via a triangular junction between Heald Green and Styal stations. Manchester Metrolink tram services were extended to the airport in November 2014 and operate to Manchester Victoria. The station is 9 3⁄4 miles (15.7 km) south of Manchester Piccadilly at the end of a short branch from the Styal Line constructed by British Rail in 1993. A branch of Manchester Metrolink runs into it. It is accessed via a triangular junction located between Heald Green and Styal. The station platforms are connected by escalator, lift, ramps and an elevated covered walkway (known as the "Sky Link") to the airport terminal buildings in which is a manned railway ticket office. Throughout the airport complex, the railway station is known as "The Station" and is signposted as such. In December 2008, a third platform opened after a year of construction and a total cost of £15 million. The following year Network Rail noted that it had "greatly increased operational flexibility at the station, and reduced the number of times that late-running trains had had to be terminated at Manchester Piccadilly." In 2009, Network Rail stated that the creation of the third platform has meant that the capacity at Manchester Airport will become constrained by the layover of the trains and congestion at the throat. To solve this issue they have recommended building a line underneath the airport towards Northwich in the 2019 to 2024 period. In July 2012, support for a fourth rail platform was announced by the Government. The current platforms are eight carriage lengths long, so each can accommodate two trains of four carriages. A fourth platform will allow greater use of longer trains of six carriages or more. This had been recommended as part of the Northern Hub scheme of rail improvements around Manchester by the 2010 Manchester Hub Rail Study and the 2011 Northern Route Utilisation Strategy, with an estimated cost of £23 million. In February 2014, construction commenced on a new £20m fourth platform at the station. The start of construction was attended by the Chancellor of the Exchequer, George Osborne. Construction of the new platform was completed in May 2015 - three years earlier than the 2018 estimate given in 2012. This was to allow engineering work to overlap with that being done on the Manchester Metrolink extension to the airport (see below) so that the fourth platform could be used for the extra traffic generated by the Ordsall Chord (opened 10 December 2017), while the fourth platform itself opened to passengers in Autumn 2015. Northern, TransPennine Express and Transport for Wales are the three current franchise holders that serve Manchester Airport. Services between the airport and Crewe (for connections to Southern England); Manchester Piccadilly; various destinations throughout Northern England and, since December 2007, to Glasgow Central and Edinburgh Waverley via Carlisle. There is a frequent service from the airport to Manchester Piccadilly. Services also operate during the night to Manchester Piccadilly and beyond including York; Doncaster; Sheffield; Scotland and Blackpool North. There are currently nine trains per hour to Manchester Piccadilly. There are no long distance services to the airport from the south; a Central Trains service from Manchester Airport to Skegness via Derby was cut back to Crewe in 2003.,there was also Virgin Crosscountry services from Birmingham New Street to Edinburgh or Glasgow, the Birmingham Services were cut in 2003 and the Scotland services were transferred to TransPennine Express in 2007. In May 2016, Arriva Trains Wales began operating an hourly (off peak) Monday - Saturday service to Llandudno via Chester. It now operates 57 services a week compared to the previous 17. First TransPennine Express previously ran the service to Blackpool North but this was passed on to the new Northern franchise in April 2016. It was planned that infrastructure developments that are part of the Northern Hub system of schemes such as the Ordsall Chord should enable direct trains to Manchester Victoria and on towards Bradford from May 2019. However the introduction of the May 2018 timetable, one of the most radical in decades, caused punctuality through Manchester to drop sharply and it became common for TransPennine Express to terminate delayed services at Manchester Piccadilly rather than continue onto the final destination at Manchester Airport. Any future additional services to the Airport are in doubt without further infrastructure works; unresolved issues surround the lack of new 'through' platforms at Manchester Piccadilly which have been shelved by the government and the Styal Line to Manchester Airport operating at full capacity with little resilience to absorb delays. The Manchester Metrolink light rail network was extended from St Werburgh's Road to Manchester Airport as part of the Phase 3 expansion project. The Metrolink station has been built adjacent to the airport station. It is the terminus of the Airport Line. Following a period of uncertainty due to funding problems, the plans were finally given the go-ahead in May 2009. The confirmed route would not complete the full airport loop as proposed, but trams would run along the northern route via Wythenshawe. Completion of the western side of the loop is subject to further funding in a later project. An opening date of Summer 2016 had originally been indicated for opening of the Airport line but the line opened early on 3 November 2014. Trams run between Manchester Airport and Victoria every 12 minutes. An early morning service runs from 03:19–06:00 am every 20 minutes. From January 2019, Manchester Airport will be in Metrolink ticket zone 4 [needs update]. ^ "Chancellor unveils the start of £600m rail investment in the north of England". Network Rail. 7 February 2014. Retrieved 22 February 2017. ^ "Manchester Airport station reopens after work to build a fourth platform is completed (news release)". Network Rail. 9 February 2015. Archived from the original on 13 February 2015. Retrieved 13 February 2015. ^ "And then there were 4". ^ "Manchester Airport rail station's fourth platform completed ahead of schedule". ^ "Train services to be cut". BBC News. 17 February 2003. ^ "'Unacceptable #NorthernFail' - the travel chaos passengers faced on first working day of new Northern timetable". Manchester Evening News. 21 May 2018. Retrieved 21 May 2018. ^ "A big chunk of Northern's timetable is back on Monday - but not for many Greater Manchester passengers". Manchester Evening News. 29 July 2018. As an industry we are really sorry for the impact that this has had on customers. Congestion on the network within the Manchester area has been a factor in the disruption and as all our services run through this corridor this caused a knock-on effect on our services across the North. ^ "Timetable recast: too much, too quickly". Railway Gazette. 4 June 2018. Retrieved 13 August 2018. 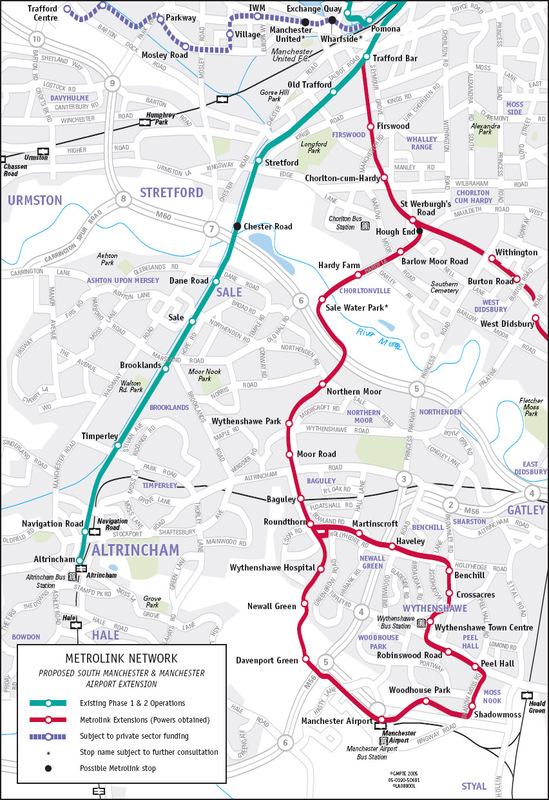 ^ "Metrolink Network - proposed South Manchester & Manchester Airport extension (map)". GMPTE. 2005. Archived from the original on 20 July 2011. Retrieved 21 May 2009. ^ "Metrolink: back on track?". BBC Manchester. 13 May 2009. Retrieved 17 May 2009. ^ Linton, Deborah (13 May 2009). "£1.4bn transport deal unveiled". Manchester Evening News. Archived from the original on 23 December 2012. Retrieved 17 May 2009. ^ "Airport line". Manchester Metrolink. Transport for Greater Manchester. Archived from the original on 13 November 2012. Retrieved 19 May 2013. ^ "Trams to Manchester Airport to arrive more than A YEAR early". Transport for Greater Manchester. Retrieved 20 June 2014. ^ "New Metrolink line to Wythenshawe and Manchester Airport to open on November 3 – a year ahead of schedule". Manchester Evening News. 13 October 2014. Archived from the original on 18 October 2014. ^ "Metrolink ticket zones map". TfGM. Retrieved 5 December 2018. Wikimedia Commons has media related to Manchester Airport station.